Run end-to-end QR code marketing campaigns with Beaconstac’s dynamic QR code generation, management and tracking tool. 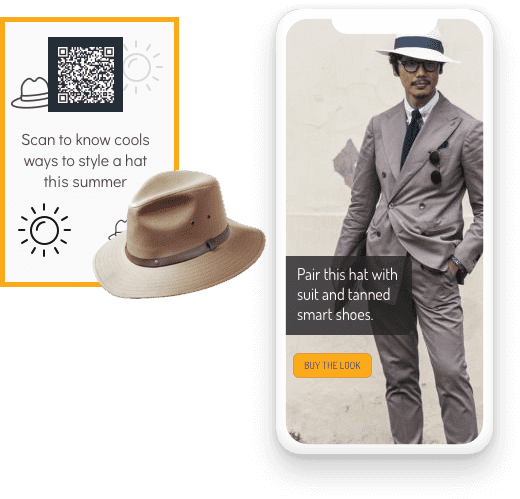 QR Code marketing is a proximity marketing channel that leverages quick response (QR) codes to bridge the gap between offline and online channels. These QR codes are put up in strategic locations for consumers to scan using their smartphone and access information about the product, brand or offers. Setting up a QR code marketing campaign is easy. It involves three steps - firstly, design your QR code, secondly, create a mobile-optimized landing page (markdown card) for the campaign and assign it to the QR code and thirdly, print these QR codes with a QR code frame or poster. You are all set to allow your consumers to scan and access relevant information. 1. Customize the QR code with your brand colors and logo. 3. Consumers scan to access campaigns linked to the code. Customize the QR code with your brand colors and logo to align with your brand. Beaconstac provides a host of other customization features as well to make your QR code stand out and get more scans. Create a landing page that users see when they scan a QR code. Creating a landing page on Beaconstac is extremely simple. Drag-and-drop your way to creating these landing pages which we call markdown cards. Markdown cards are designed to be accessed on a mobile screen. If you already have a campaign webpage that you want to direct to, you can skip creating a markdown card. Assign the markdown cards created to the QR code. If you already have a campaign webpage, tie the webpage URL to the QR code. This makes sure that scanning the QR code will direct consumers to this webpage. The best part about this QR code solution is that you can change the link attached to the QR code whenever you want, without changing the QR code on the print. The last step is to create a poster or frame that informs consumers about the offer or information, and the value of scanning the QR code. Beaconstac provides multiple templates that can be used for the purpose. Print these QR codes and paste them on product, aisles or sale signs. Update/modify the target URL behind the QR code, anytime - even after being printed. Customize your QR code with brand logo and colors to fit your marketing campaign. Design, create, manage and track QR code campaigns, all-in-one place. Download QR codes in the size and type you want. We provide png, jpg and SVG formats. Recapture the attention of customers when they go online on Facebook and Google. Track QR code scans, time of the day, location (city/country) and device OS used to scan. Dynamic QR codes, also known as smart QR codes allow marketers and business owners to showcase different campaigns at different hours of the day and days of the week, without changing the QR code on print material. Once QR codes are printed and distributed there is no turning back. Changing the campaign or launching a new campaign usually means printing a new set of QR codes and re-distributing them to your consumers. Not anymore with dynamic QR codes. Dynamic codes allow you to modify the campaign or start a new one with the same printed material. 1. Fine-tune your on-going marketing campaigns based on QR code performance. 2. Save time and money when you decide to change the target URL. 3. Schedule campaigns based on peak hours and seasons. Offer 20% off on pancakes in the morning, 10% off on pizza at lunch and buy 1 get 1 offer for dinner - all using the same poster which reads - “Delicious offers on today’s special”! How can QR codes be used in marketing? Here are some crucial pointers to be kept in mind while creating and printing QR codes. QR codes should not only be beautiful but also functional and compelling for consumers to scan. 1. Give consumers a reason to scan: Include a call to action along with the QR code. Using a QR code frame is a good option. 2. Customize it to fit the marketing campaign: Avoid using black and white QR codes. Make it attractive and personal by customizing it with brand colour and logo. 3. Place the QR code strategically: Use high contrast QR codes that are easily scannable. Avoid using a dark background for QR codes. This reduces the readability of the QR code. 4. Do not distort the QR code: While resizing the QR code on posters or billboards, make sure you maintain the proportion. Use shift+drag to resize QR codes. A distorted QR code is difficult to scan. 5. Make sure the QR code stands out: Maintain whitespace around the QR code. This helps the scanners to distinguish the QR code from its surroundings. 6. Avoid using multiple QR codes in one poster: It’s usually difficult when you use QR codes to drive app downloads. Do not use 3 different QR codes for App Store, Play Store and Windows App Store. Instead, create a QR code with a universal link that redirects to different app stores depending on the device being used for scanning. 7. Use high-quality QR codes: Pick the right size of the QR code for your use-case. Make sure the QR code is not blur. Not only does this give a poor impression of the campaign, but also becomes difficult for scanners to scan them. 8. Maintain the scan distance to the QR code size ratio: For effective scanning, the ratio of scan distance to QR code size is 10:1. Make sure you use bigger QR codes for billboards than you would use for an in-store poster. 9. Consider scanning time: Avoid printing QR codes on moving vehicles because depending on the smartphone and the scanner, the scanning time differs. The time required to scan a QR code on a truck might not be sufficient. 10. Link your QR code to a mobile-optimized campaign webpage: If you are using Beaconstac’s platform to create landing pages (markdown cards) they are designed for mobile.